The price range, quality, and diversity of add-on lenses for iPhones is enormous. But you may have to buy into one ecosystem. Editor's note: This article was originally published on November 11, 2016, and was updated on August 14, 2017 with up-to-date pricing information. The iPhone has a very good camera, but you can get more out of it by using an add-on lens. They can increase the amount of zoom, or they provide an effect that gives your photo more impact. In this roundup, we gathered several iPhone lens systems, put tested them with an iPhone 6s, and reviewed and rated each one. You’ll find our top picks below if you need to make a buying decision right away. Click on the product links in the summary boxes to read the full reviews, and be sure to read on to learn how we tested and to get our impressions of the market. The ExoLens Zeiss lenses offer the best possible image quality with the least amount of equipment and fuss. While the lenses may seem pricey, they deliver. Photos taken with these lens displayed colors that are perfectly in phase, crisp details, and no distortion. 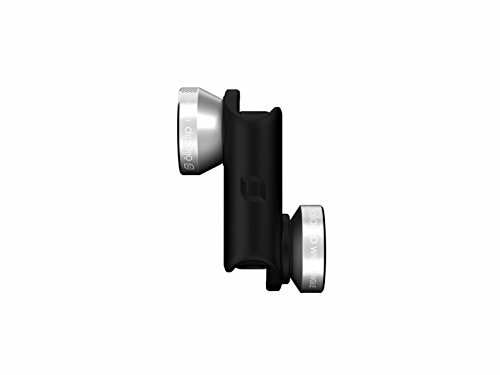 The ExoLens Zeiss lenses use an aluminum bracket that fits over the iPhone, and you screw on the interchangeable lenses to the bracket. The frame has a hot-shoe mount and a tripod boss for attaching a standard tripod screw. 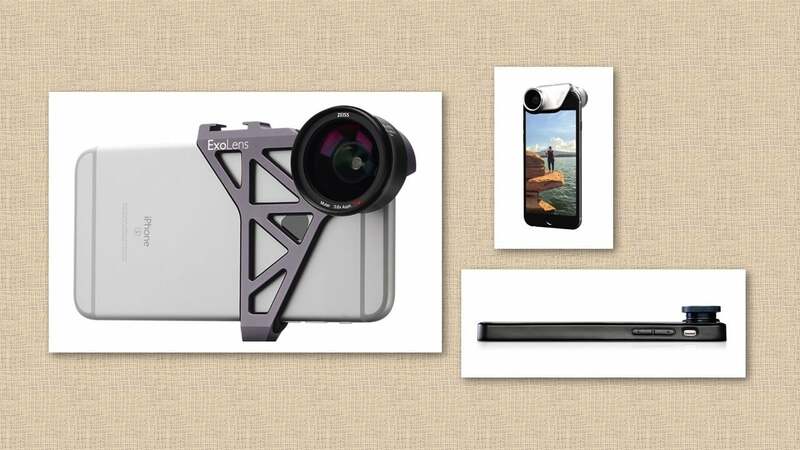 The Hitcase Snap costs $50 and includes a iPhone case fitted with a TrueLux Wide Lens, a selfie stick, a tripod mount, a lens cap, and a keychain lens holder. The TrueLux Superwide Lens ($35) and the TrueLux Macro Lens 3x ($25) can be purchased separately. The wide-angle lens, which seems to be about an 18mm equivalent, is of medium quality. It’s remarkably free of chromatic aberration, with colors appearing consistent out to the edges. Photos have a high amount of blurriness outside of a broad central circle of focus. The macro lens produces images that are less blurry around the edges, and the blurriness is also less noticeable. I don’t recommend the super-wide lens, which captures neither the scope of a full fisheye, nor the realism of a wide-angle. The lenses rotate and snap satisfyingly into place in the case, and are easy enough to remove, but can’t be jarred out of place or unscrewed accidentally. The 4-In-1 ($80 MSRP, same price on Amazon) has both a 10x and 15x macro lens permanently built into a clip, and screw-on fisheye and wide-angle lens. If you want to take a lot of close-close shots, it’s actually fairly stellar, especially when cropped square. The wide-angle lens has a lot of distortion, and there’s surprisingly modest aberration around the edges. Again, cropping square removes many defects. The fisheye lens uniquely works with both the rear-facing iSight and front-facing FaceTime cameras on an iPhone. It can be useful in capturing an otherwise impossible group shot. To get all the details on our iPhone lens testing, click on a link below. What else have we’ve reviewed? See the list below and click on the product name to get more info. We’ll update this list and roundup on a regular basis, so bookmark this article and come back to see what’s new.